Beloved creepy-crawlies of the SA coastline, yrrrrrrrah if we don’t love our kreef. For Reuben Riffel, West Coast Rock Lobster (to give them their correct name and title m’lord) have been a life long love affair. Simply braaiing the crustaceans is his first choice and in this recipe from Braai – Reuben on Fire (one of the Sunday Times runners up for Cookbook of the Year) he upgrades braaied kreef with a few simple yet elevated tweaks. Pair it with a Saggy Stone California Steam beer or the Haut Espoir Chardonnay and you will struggle to get the grin off your face for most of summer. 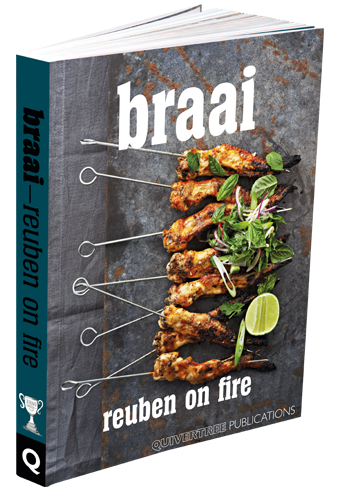 Get stuck into the recipe below and get Braai – Reuben on Fire (the perfect Christmas gift for the braaimasters in your family) from all good bookstores and online retailers. Growing up, we used to head to the coast at Paternoster in a big rented bus with the whole family crammed inside. Often with the tyres on their last legs, the thing would break down and what should have been a few hours turned into a much longer ordeal as people got stressed and started drinking. The tortuous journey aside, the overriding flavour I remember from those trips was the crayfish. We couldn’t afford the whole thing but would get the heads, stuffed with newspaper and cooked. Since those days, I’ve been spoilt with access to crayfish. Most of the time when you get crayfish, you want to cook it simply because it’s such a precious treat, but as with anything, if you happen to get it in abundance, you start wanting to try different things, like putting it in curry etc. For me, putting kreef on a braai is still first prize, but there are ways to respect that most brilliant of kreef cooking styles while subtly notching it up a bit. If you take something you do in a restaurant, like basil butter, it works even better as a combination with crayfish than parsley. As this wonderful butter melts into your crayfish and is topped with the roasted tomato sauce and the herbal element of parsley and coriander, it gives you the sense of sophistication that your dish could be at home in a fancy restaurant. Then you open your eyes and realise that it’s even better that you’ve done it in your backyard or on the beach and your friends and family are wowed by how you’ve elevated such a beloved South African ingredient without overdoing it. 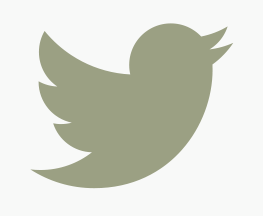 That is satisfying. 1/ To make the basil butter, blend all the ingredients until smooth. Set aside. 2/ To make the chopped tomato sauce, make a foil bowl 40cm long x 30cm wide x 7cm deep. Heat the olive oil in the bowl and sweat the onion, garlic and leeks. Deglaze with the white wine and reduce by half. Add the roasted tomato, saffron, salt and pepper and reduce by a third. 3/ Season the crayfish evenly with salt and pepper. Rub with oil. Grill for two to three minutes on a grid over medium-high heat with the meaty side down first, then grill for two to three minutes on the shell side. 4/ Dress with chopped tomato sauce and cook for three to five minutes. 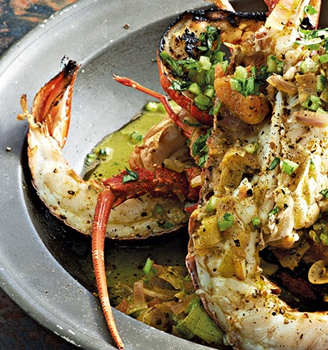 5/ To serve, drizzle the crayfish with basil butter. Mix together the celery and coriander to garnish.